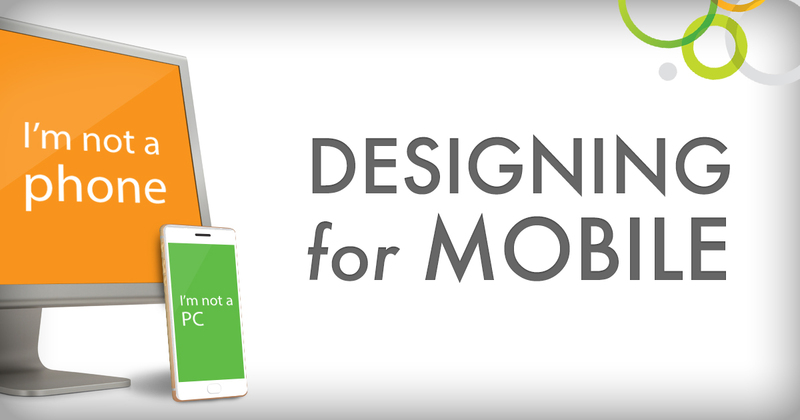 A phone is not a smaller laptop when it comes to design, but there's more to the story. When consuming digital experiences / applications / web sites, our expectations and needs are shaped by the device we’re using. The smaller size of smartphones isn’t the only characteristic that sets them apart from tablets or desktop computers. Some of what sets smartphones apart is their technical limitations. Phones have less processing power than larger devices and internet connectivity can be more spotty on phones making internet-based tasks more frustrating. Ultimately though, the smaller screen size is the largest factor dictating our behavior and expectations. For most smartphones our fingers are the primary method for manipulating the user interface. As such, since our fingers are bigger and less precise than cursors, we need bigger more generous targets to tap. Because of this interaction method the UI for smartphones should be larger with bigger buttons. Larger things on smaller devices means the screen is filled pretty quickly. It is this double whammy of sizing that leads to one of the most important considerations for designing for mobile. Design for the desktop experience first and then reduce the amount of content for mobile. Design for mobile first and then add more content on larger devices. It’s fashionable currently in the UX community to choose the later and design for mobile first. The thinking is if you can meet the users’ needs on a smartphone, where there are the most design limitations, then you can scale up and add more content for the desktop experience. It is harder to scale-down then scale-up. 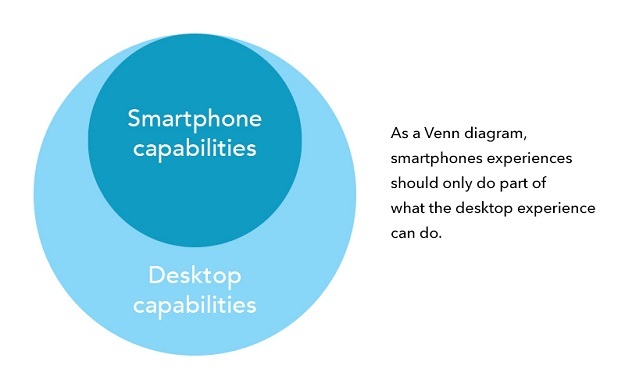 If you know that most of your users will use the desktop experience (such as in BI), but you want to still consider a few smartphone users, then start with designing the desktop experience first and scale-down for phones. With all of this said, designing for mobile isn’t just how much content you are including/excluding. Designing for mobile is realizing that because of a smartphone’s size, technical limitations, and interaction method, people don’t need or want to be able to do everything on their phones like they can on their desktop computers. We don’t want to have all the same features available on all devices. The smartphone isn’t just a smaller laptop. It is a different approach to consuming & manipulating content. Don’t just take all of the same content from the desktop experience and find a place to cram it into a phone. You should design for smartphones with the knowledge of what your users want to know and accomplish on a phone, and design an experience to meet those needs. Similarly, knowing what your users will want to know or accomplish on a laptop, you design for that. There will certainly be overlap, and that overlap should maintain design consistency, but there will be things that don’t need to be included on the phone experience. No smartphone experience is perfect but the best experiences give users all of the content they need on-the-go, with the features they will use, and excludes extraneous / hardly-ever-used features. When designing Qlik apps for phones: ask your client why users will be opening the app on their phones. What will they want to accomplish on a smartphone? Perhaps it really is to fully explore an application, or more likely it is to get some basic information and then close the app. Design for what they need and omit the rest. For more information on designing for mobile, and user experience design for business intelligence in general, we have a guide of best practices available to help you create the best designed application.